Andre Kirk Agassi, born on the 29th of April, 1970 is a retired American tennis player. 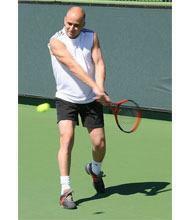 As a professional player Andre Agassi highest ranking had been former World Number 1. He is considered by critics and other players as one of the greatest Tennis Players of all times. "Perhaps the biggest world wide star in the sport's history", has been cited by the BBC on his retirement. Agassi has won eight grand Slam Singles Title among the fifteen finals he had competed in. He is even an Olympic gold medalist. Brilliant at all surfaces; he is the first of two male players to have achieved a singles Career Golden Slam, and one of the four male players to have achieved a singles career Grand Slam in the Open Era. Andre Aggassi record of being the first male player to win all four Grand Slams on three different surfaces (hard, clay, grass). He is till now the last American male to win French Open and Australian Open. Agassi also won 17 ATP Masters Series Titles. He is the only male player to win all four Grand Slam tournaments, the Olympic Gold medal and the ATP Tour World Championships. Agassi started playing Tennis from a very young age. In a Book he details on how his father made him play tennis for money against the football legend Jim Brown when he was only 9 years of age. He lost the first two matches intentionally to higher the amount of the bet and at last won the last match and also the money with it. At an age of around 13, Andre was sent to Nick Bellottieri's Tennis Academy. He was to stay there only for three monthes for his father couldn't afford more. But seeing the talent in the young boy Nick returned the cheque back to his father and started teaching him just for free claiming that the boy had more talent than anyone else. He turned professional at the age of 16 and won his first competition in La Quinta, California. By the end of the year he was ranked as the world Number 91. In 1987 Aggasi won the first top-level singles title and ended up that year from 91 to World Number 25. In 1988 He won six additional tournaments and by december he became the first person to reach that level in such a small time. It was during that year that he set the Open Era record for consecutive victories by a male teenager, a record which stood for 17 years until broken by Rafael Nadal in 2005. He ended the year ranking World Number 3. In 1990 Aggasi helped United States win its first Davis Cup in 8 years and won the Tennis Masters Cup even. Agassi's Grand Slam tournament breakthrough came at the Wimbledon open. Agassi was called the BBC Overseas Sports Personality of the year in 1992. 1993 saw only Andre Aggassi's doubles title win of his Career at Cincinnati Masters for he missed the other events because of his injury. In 1998, Agassi won five titles and leapt from World No. 110 to No. 6, the record of the highest jump into the Top Ten during a calendar Year. Andre Agassi created history in 1999 when he became the fifth Male player to have won all four Grand Slam singles titles during his career and also an Olympic Gold Medal. He also became the first one to win the Grand Slams on all three surfaces. In 1999 he reached the Wimbledon finals losing it but then winning the US Open. Agassi ended the year 1999 as World Number 1. He began the next year by beating Sampras at the Australian Open. He continued winning this cup till 2001, ranking as the world Number 3. He was the only male player to finish a year ranked in the top ten for consecutive three decades. He was the oldest player to finish at top three when he was 31. 2002 started with disappointment as injury forced him to skip the Australian Open. In 2003, Agassi won the eighth and final Grand Slam of his Career thus again recapturing the Number 1 position on the 16th of June, 2003 which he held for 12 weeks. After that Andre Agassi injuries stopped him from playing. He suffered from sciatica, spondyololisthesis and a bone spur that infected the nerve. These injuries brought his career almost to an end and he could not make any more great achievements after this. The Tennis Career of this Great star totally came to an end in 2006, though in the last few years he could not make any significant achievements.